It's a grill on one side and a griddle on the other. I use it for all kinds of stove-top grilling, including cooking the veggies for Salsa Verde. I love this blender! Used it to puree the Salsa Verde ingredients in a snap. This is similar to the more common Mediterranean oregano, but it is stronger, less sweet, and well suited for Mexican cuisine. These are the jars I use most often for canning salsa. These full size sheets work ink-jet printers. 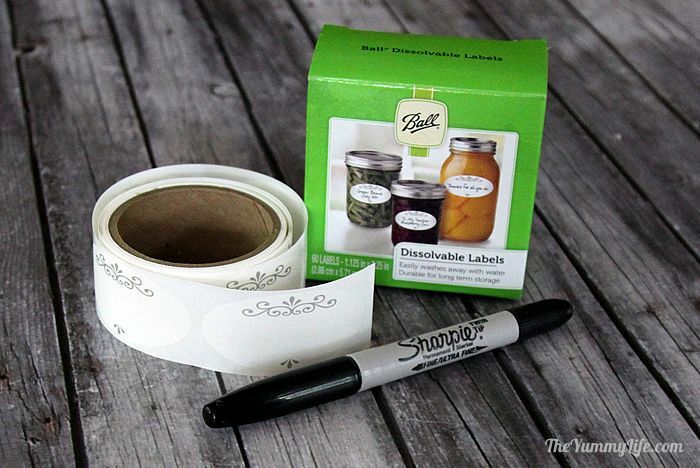 Print a sheet of labels, cut them apart, and adhere them to jars for a polished finishing touch. 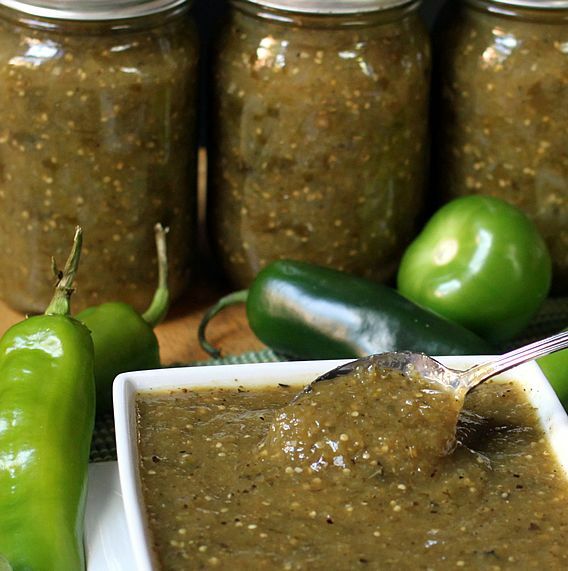 A recipe with tomatillos & chile peppers to can, freeze, or eat fresh. Vegan and gluten-free. 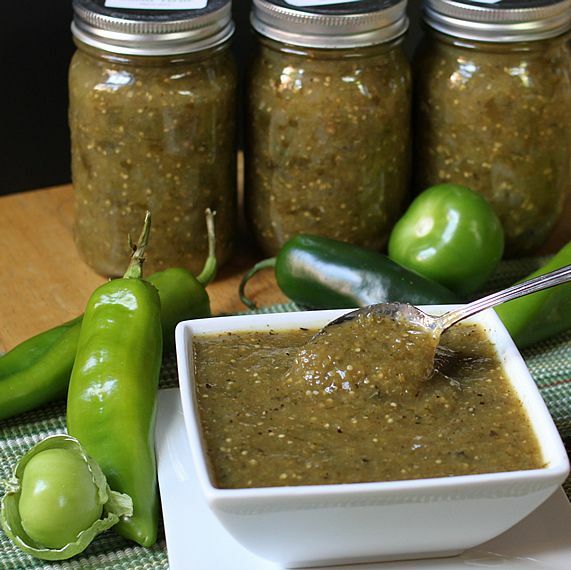 A recipe with tomatillos, green chiles, and jalapenos to eat fresh now or can or freeze for later. Great with chips, as an enchilada sauce, or stirred into soups and chilis. --OVEN ROASTING: Preheat oven to 500 degrees. Place veggies in single layer on foil-lined baking sheet. 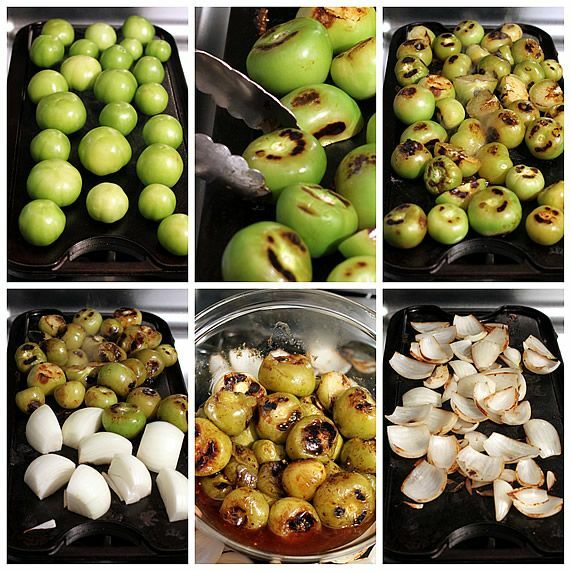 Bake 15-20 minutes until tomatillos & peppers are charred, softened, and oozing juices. --STOVE-TOP GRILLNG. Heat stove-top grill/griddle on medium high heat. Arrange veggies in single layer, rotating with tongs until charred bits are present on all sides, and tomatillos are soft and oozing juices; move to bowl to collect juices. PEEL, STEM & SEED the green chiles. Stem & seed the jalepenos (skin can be left on); or leave seeds if hotter salsa is desired. Leave skin on tomatillos. BLEND INGREDIENTS: Add roasted veggies (including juices that collected after roasting) and remaining ingredients to a blender or food processor; blend until desired consistency--anywhere from slightly chunky to pureed. To eat salsa without canning, wait at least 4 hours to eat to allow the flavors to blend and vinegar to mellow. Best if eaten the next day. Store in refrigerator for up to 2 weeks. TO FREEZE, transfer salsa to freezer-safe containers and freeze for up to 6 months. Allow at least 1/2" headspace for expansion when frozen. TO CAN: add blended salsa mixture to pot on stove top, bring to a boil, reduce heat, cover and simmer 15 minutes. Pour salsa into hot, sterilized pint or half pint jars, leaving 1/4 inch headspace. Process for 15 minutes in boiling water canner. Turn off heat and remove cover; leaving jars in hot water for 5 minutes. Remove jars carefully and rest on towel undisturbed for 12-24 hours. If any jars don't seal, store in fridge to use within 2 weeks; or freeze. Canned salsa tastes better if it's stored unopened for at least 1 month to allow flavors to blend and vinegar to mellow. Recipe may be doubled or tripled. *Based on reader feedback, this recipe was revised in August 2014. The current ingredient list includes a reduced amount of vinegar from the original recipe. It remains safe for water process canning. 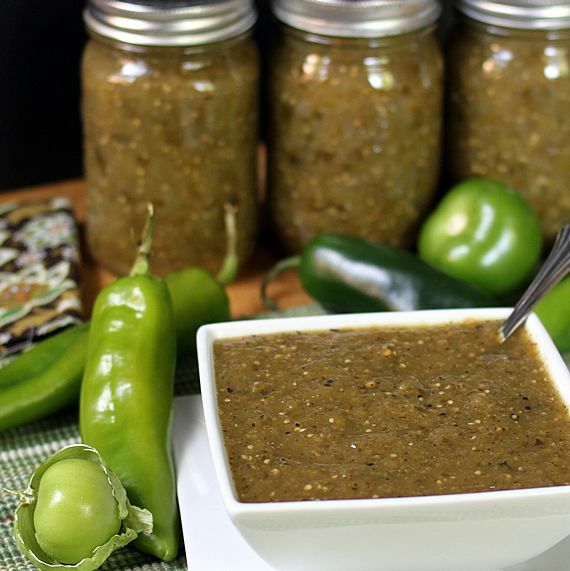 Salsa verde (translation: green sauce), also known as chile verde, can be eaten as a dip or condiment with tortilla chips & tacos, used as enchilada sauce, or added for a flavorful boost to carnitas or soups & chili. Green enchiladas are one of King-Man's favorite meals, so I make this sauce in big quantities and can it to have ready throughout the year. It freezes well, too. You can also make a batch of this salsa and eat it fresh. It will keep in the fridge for up to 2 weeks. This recipe is vegan and gluten-free. 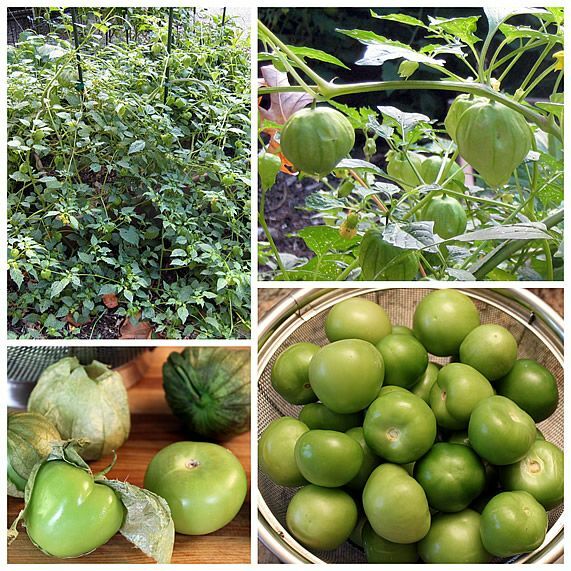 I started growing our own tomatillos and chiles last year--I call it our "salsa garden"--so that we can enjoy homegrown, homemade salsa verde. If you're not a gardener, look for the ingredients at farmers markets and in your grocery store. TOMATILLOS. In case you're unfamiliar with this fruit, below are photos of some from my garden. They look similar to green tomatoes and are covered with a papery husk. Turns out that tomatillos like St. Louis weather. Just two plants produced enough for a year's worth of salsa verde. You can read more about this staple of Mexican cooking here. Freeze whole tomatillos. If you have a bounty of these green guys in your garden or want to stock up while they're plentiful in markets, they are easy to freeze. Simply remove the husks, wash and dry them, put them in ziploc freezer bags, and freeze them for up to 6 months. We had such a late freeze last year that I had a 2nd crop to harvest in early November. I bagged and froze them and was able to use them for a batch of salsa verde the following March. GREEN CHILE PEPPERS. Being from New Mexico, I love my chiles and grow a variety in my garden. For chile verde I use a combination of Anaheims and jalapeños. These are both widely available in our grocery stores. 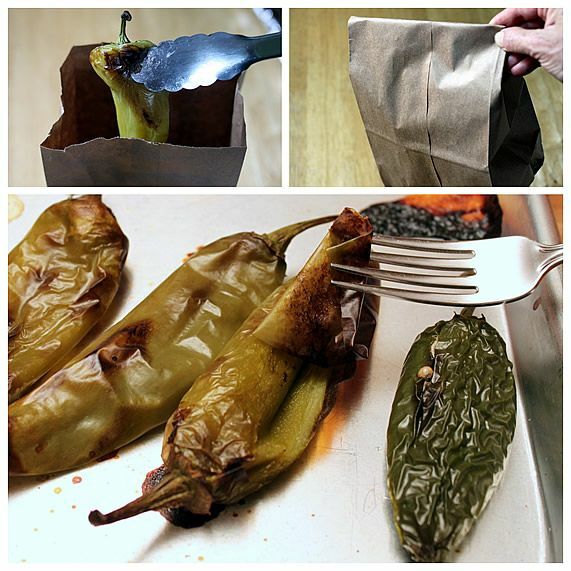 You can substitute other large green chile peppers for the Anaheims, like poblano or New Mexico chiles. They all carry different amounts of heat, so you can customize your salsa depending on your heat tolerance. I personally think the Anaheims are pretty mild, but I admittedly have a high tolerance for spice and heat. Poblanos are mild but have a good flavor, if you prefer something less spicy. The jalapeño seeds can be left in (for more heat) or removed, again depending on how spicy you want it. Not only can the heat vary widely between different chiles, even two of the same variety can have vastly different levels of heat. I taste and make adjustments with every new batch I make. 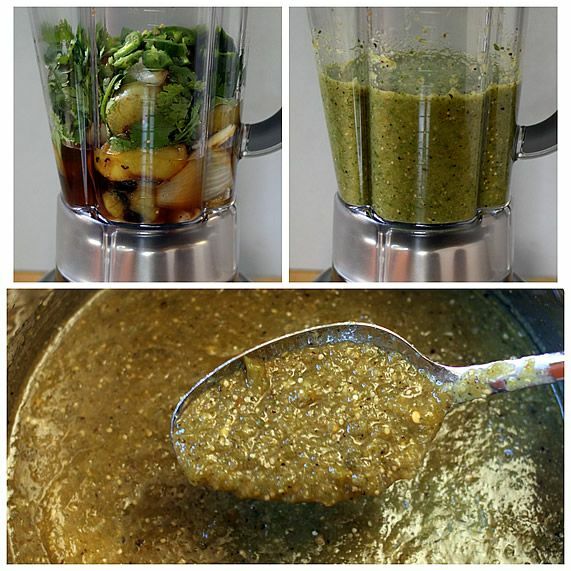 Here's how I make salsa verde. It's really easy once you gather the supplies. Step 1. 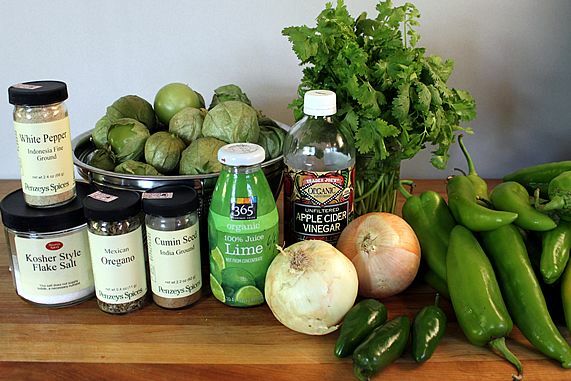 Assemble the ingredients: tomatillos, green chile peppers, jalapeños, onions, cilantro, bottled lime juice (you can use fresh if you won't be canning the salsa), cider vinegar, black pepper, white pepper, kosher salt, oregano (Mexican preferred, if available), ground cumin. What is Mexican oregano? It's similar to "regular" Mediterranean oregano but is stronger and less sweet. It pairs particularly well with cumin and other Mexican flavors. It's fine to use regular oregano in this salsa if you don't have the Mexican variety. About the lime juice. I recommend fresh lime juice if you're eating this fresh or freezing it. However, if you're canning the salsa you must use bottled lime juice. This is because the pH of fresh limes can vary; bottled lime juice has a consistent pH that makes it more reliable for canning safety. About the vinegar. The vinegar adds a tang that I think enhances the flavor. It is also necessary as a preservative if you want to can the salsa or keep it awhile in the fridge. If you are canning the salsa, you should not reduce the amount of vinegar. However, you can omit or reduce the vinegar, if you will be refrigerating and eating the salsa within two weeks (possibly longer). The vinegar's intensity will mellow some in a few hours, and even more the next day. That's why I like to make mine a day ahead, when possible. Step 2. Roast the veggies--this adds so much flavor to the salsa. I've used two methods that both work well, so use whatever method suits you. 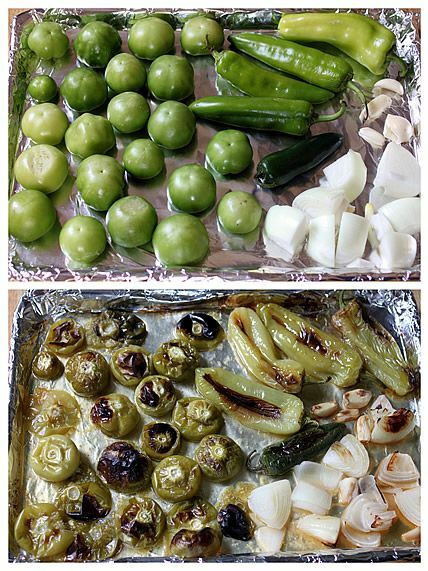 Oven roasting method: place the tomatillos, peppers, onion and garlic on a foil lined baking sheet and put in a 500 degree oven for 15-20 minutes, until they are slightly charred and the tomatillos are soft, oozing, and are a pale yellow color. Stove top griddle method. This is the way my sister, Nelda, learned to cook the veggies on a trip to Guatemala, so I gave it a try. First I put the tomatillos on a hot cast-iron griddle, and turned them as they cooked so they'd get charred marks all over them. When they were cooked through, oozing juices, and had completely lost their bright green color, I transferred them to a bowl. As there was room, I added the onions, garlic, and peppers to the griddle and cooked and turned them in the same way. This method made it easy to keep an eye on the veggies as they cooked. The only thing I didn't like was cleaning the griddle when I was through! It took some elbow grease. Step 3. Peel the peppers. While the roasted peppers are still hot, place them in a covered bowl or folded paper bag for 10 minutes to allow them to steam and make the peel easier to remove. 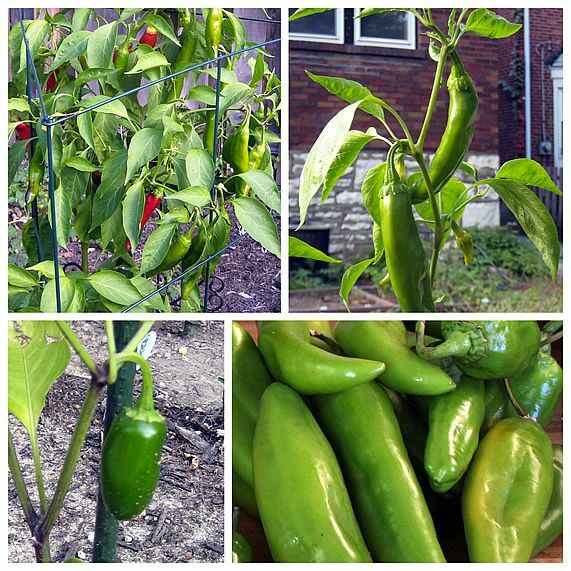 Jalapenos have a very thin skin that doesn't need to be peeled, but most other chile peppers should be peeled, stemmed, and seeded. Wear plastic gloves while handling the peppers. Read my previous post, How to Roast and Peel Peppers, for more detailed tips and instructions for grilling them outside. NOTE: The tomatillos do not need to be skinned. In fact their softened, charred skin adds important flavor to the salsa. Step 4. Add all of the ingredients to a blender or food processor and puree them. The salsa is ready to eat fresh, store in the fridge, or freeze. If you want to can the salsa, read on for canning instructions. INSTRUCTIONS FOR WATER PROCESS CANNING: Add pureed salsa to large pan on stove top, bring to a boil, and lower to a simmer; cover and simmer for 15 minutes. Add hot salsa to hot sterilized pint or half-pint jars leaving 1/4" of headspace, and gently boil in water canner 15 minutes. Turn off heat, and leave jars in hot water for 5 minutes. Remove and let rest undisturbed for 12-24 hours. Salsa is best if jars are stored for 1 month before eating to allow the flavors to blend and the vinegar to mellow. About canning safety: Always follow jar preparation and processing recommended by the USDA. If you want more detailed canning information, I recommend the Ball website. They are the ultimate authority, and their site is loaded with detailed information and recipes suited for canning. You can safely adjust the seasonings in this salsa recipe, but do not change the ratio of other ingredients. They must be balanced correctly to have a pH level that is safe for bacteria-free canning. 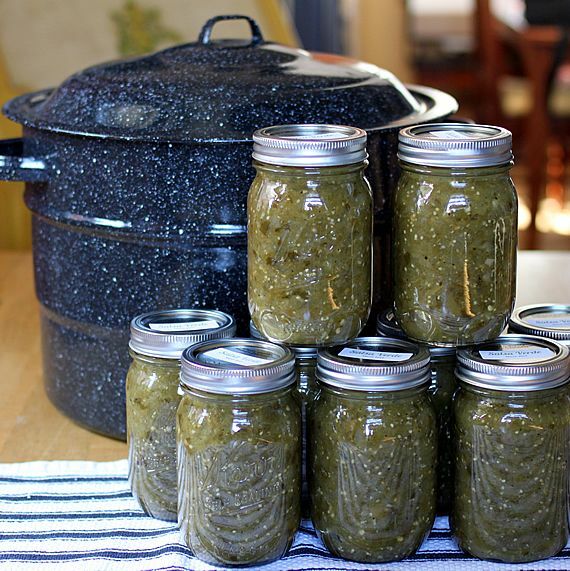 I triple the recipe for canning purposes to yield 7-8 pints of salsa verde. For a finishing touch, I like to label my jars. That way they're easy to identify and organize, and they're ready for gift giving, too. Print these on card stock, cut them out, punch a hole in the corner, and hang them from the jar neck with a ribbon, string, or rubber band. 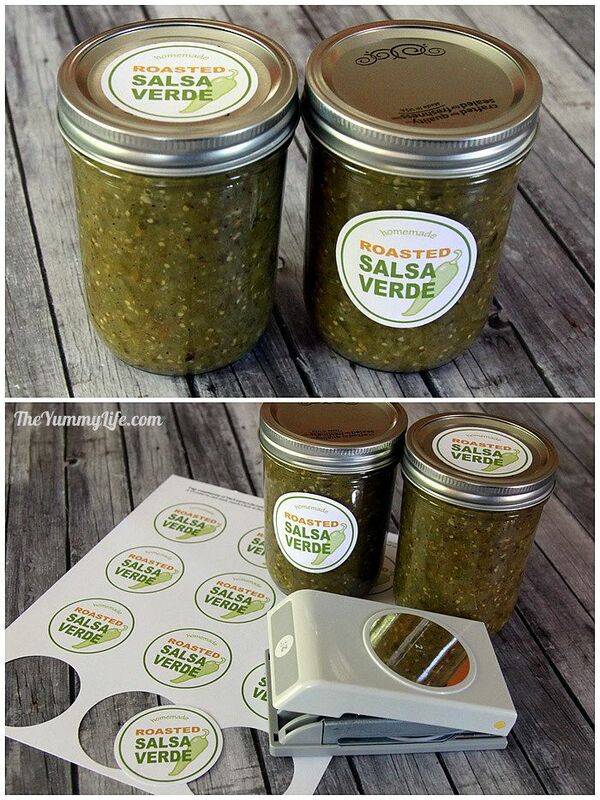 Print them on sticker paper and stick them to the jar lid or side. Or, stick them on with tape. Click on the image below to download & print a full sheet of labels. 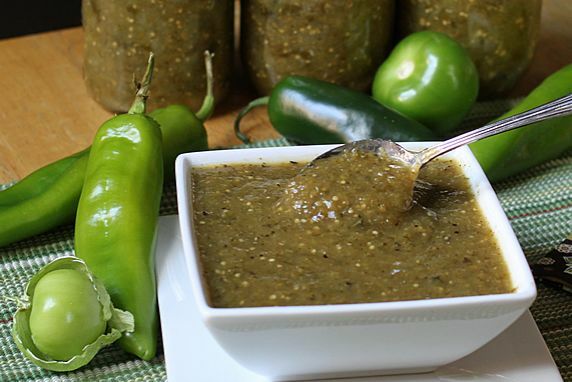 It's so convenient to have this flavorful salsa on hand for quick Mexican meals. It's our favorite enchilada sauce and also makes a fun, unique hostess gift. 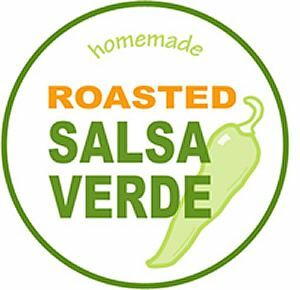 Salsa verde has a distinctive tart & spicy combination of flavors. Roasting the veggies makes it even better, adding little charred bits that you can both see and taste.